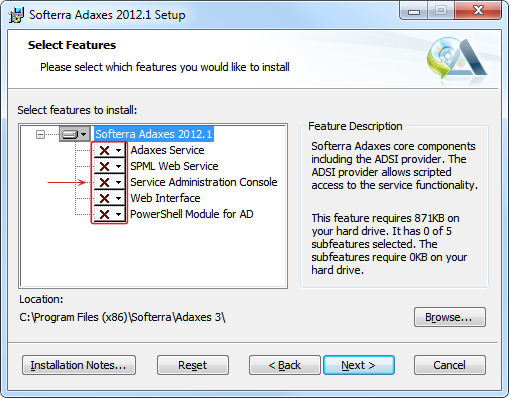 This document contains requirements and instructions on how to install Softerra Adaxes 2013.2. * Prior to install Adaxes Service on Windows 7 or Windows Vista, you need to install Active Directory Lightweight Directory Services (AD LDS). For details, see How to install AD LDS on Windows 7 and Windows Vista. * It's highly recommended to install Web Interface and SPML Web Service on the server editions of Windows because when installed on workstations, IIS has a limitation on the number of simultaneous connections. In this case, the connection limit can be reached when, for example, only two or three persons are using the Web Interface at the same time. Softerra Adaxes components require Microsoft .NET Framework 3.5 SP1 to be installed on the target system. To install the framework, see How to install Microsoft .NET Framework 3.5 SP1. To install Adaxes Service on Windows 7 or Windows Vista, first you need to install Active Directory Lightweight Directory Services (AD LDS). For details, see How to install AD LDS on Windows 7 and Windows Vista. To use cmdlets included in PowerShell Module for Active Directory, Windows PowerShell 2.0 is installed on the target computer. For details, see How to install Windows PowerShell 2.0. All Adaxes components (Adaxes Service, Web Interface, Administration Console, PowerShell Module, etc.) are installed using a single installation package. It is not necessary to install all the components on a single computer. In case you need to install different components on different computers, install the Adaxes service first, because to install other components you will need to specify the network location of the Adaxes service. Install Microsoft .NET Framework 3.5 SP1, if not installed. For details, see How to install Microsoft .NET Framework 3.5 SP1. Note: All Softerra Adaxes components (Adaxes Service, Service Administration Console, Web Interface and SPML Web Service) are installed by a single MSI package. The default service administrator account should have enough privileges to publish and unpublish the Adaxes service in Active Directory (create/delete a service connection point). By default, domain administrators have the necessary permissions. For more information on how to grant these permissions to another user, see Grant Permissions to Publish Adaxes service. Note: The AD domain of the default service administrator will be automatically registered to be managed by Adaxes. On the Ready to Install page, you can define whether to open the Windows Firewall port that is used for communication between Adaxes Clients (e.g. Adaxes Administration Console or Adaxes Web interface) and Adaxes service. If the Open port 54782 in Windows Firewall option is enabled, an inbound rule for port 54782 will be added in Windows Firewall. If you uninstall Adaxes, the rule will be deleted automatically. On the Web Interface Types page, select Web Interface types you want to install and configure IIS web site parameters for each Web Interface type. Allows Active Directory administrators to perform practically any operation in Active Directory. Allows Help Desk operators to handle tasks related to user account management like password reset, unlock/enable/disable user accounts, modify general properties of AD objects, etc. Allows regular users to accomplish self-service tasks without any assistance from administrators or Help Desk staff. Users can update their private information, change passwords, perform basic searches in AD, etc. Note: After the installation, you will be able to configure the installed Web Interfaces to meet the specifics of your company. On the Service for Web Interface page, specify the DNS host name of the Adaxes service the Web Interface will connect to. If the specified Adaxes service shares its configuration with other Adaxes services, the Web Interface will connect to the nearest available Adaxes service contained in the configuration set. On the SPML Web Service Address page, configure IIS web site parameters of the SPML Provider and click Next. On the AD Access for SPML Web Service page, specify how you want the Adaxes SPML Provider to access Active Directory. Adaxes SPML Provider can access Active Directory directly or via an Adaxes service. Provisioning Active Directory via the Adaxes service allows you to benefit from the Softerra Adaxes features such as Business Rules, Security Roles, Property Patterns. If the SPML Provider accesses Active Directory through an Adaxes service and this service shares its configuration with other Adaxes services, the SPML Provider will connect to the nearest available Adaxes service contained in the configuration set. Note: This page is not available if you install Adaxes Service and SPML Web Service at the same time. In this case, the SPML Web Service will use the Adaxes service installed during this installation. During the installation you might be prompted to provide the Windows installation files. It might be necessary to install Windows components used by Softerra Adaxes (e.g. Web Interface and SPML Web Service require Microsoft IIS that is a Windows component). For many configurations it is desirable to install Adaxes service on multiple computers in order to achieve fault tolerance and load balancing. In a multi-server environment there are multiple Adaxes services that share common configuration (managed AD domains, Security Roles, Business Rules, Scheduled Tasks, etc.). Clients connect to the nearest available Adaxes service. If an Adaxes service becomes unavailable, clients are automatically switched to another one. Adaxes services sharing common configuration form a logical grouping called a configuration set. When the configuration of an Adaxes service is modified, the configuration of other services in the configuration set becomes inconsistent with the most up-to-date configuration. As the changes get replicated through the configuration set, all service configurations become identical once again. Adaxes uses a type of replication called multimaster replication. In many circumstances it may be sufficient to use a single-server configuration. However, if you have a geographically distributed environment, or there is a heavy load on the Adaxes service, or you want to improve the availability of your Adaxes service, you may consider a multi-server approach. Install the first instance of Adaxes service. This will create a configuration set with only one Adaxes service. During installation of subsequent instances of Adaxes service, join each new service to the configuration set. For this purpose, on the Service Configuration page of the installation wizard, select the Share configuration option and specify the DNS host name of any Adaxes service from the configuration set. To join a service to a configuration set you will need to provide the credentials of the default administrator of any Adaxes service contained in the configuration set. You can install Adaxes Web Interface in a web farm if you want to share the web-site traffic across multiple servers, improve site availability, and balance load among sites. Install Adaxes Web Interface on the Primary Server in the web farm. Since the Web Interface requires Adaxes ADSI provider, install Adaxes ADSI provider on each Secondary Server in the web farm. Launch the Adaxes installation wizard. On the Select Features page, deselect all the features and click Next. Finish installation by following the instructions in the wizard. Note: When you upgrade the Web Interface you will also need to upgrade the Adaxes ADSI provider on each Secondary Server in the web farm. Configure client affinity for the web farm. Since Adaxes Web Interface requires all client requests to be routed to the same web server during a client session, you need to configure load balancing to map a client to a Web Interface for the duration of a client session. The load balancing algorithm must be applied only for the very first request from the client. From that point on, all subsequent requests from the same client must be routed to the same Web Interface for the duration of the client session. Select the server farm and double-click Server Affinity. Enable the Client affinity option and click Apply. A similar load balancing model needs to be applied if you use F5 BIG-IP LTM. This is achieved by configuring Source Address Persistence. Go to the F5 BIG-IP LTM configuration page. Expand Local Traffic in the navigation panel and select Profiles. Open the Persistence tab and then click Create. In the General Properties section type the desired name of the profile you are creating. Select Source Address Affinity in the Persistence type drop-down list. Customize other settings of the profile according to your requirements and click Finished. Open the virtual server(s) that hosts Adaxes Web Interface and open its Resources tab. In the Default Persistence Profile drop-down list, select the name of the persistence profile you have created. To make Adaxes Web Interface and Administration Console available from outside, they can be installed in the DMZ (also known as perimeter network or extranet). Web Interface can be exposed to the Internet to allow users to perform tasks like password reset and directory search when they are not on the internal network (e.g. users travelling, users working from home, or external users). If you install Adaxes Administration Console on a computer in the DMZ, Administrators will be able to connect to the computer using Remote Desktop and manage Adaxes and Active Directory from outside the internal network. Install a Read-Only Domain Controller in the DMZ. Adaxes Web Interface and Administration Console can be installed only on the computer that is joined to an Active Directory domain. Since DMZ is usually a highly restricted piece of network, it is recommended to use Read-Only Domain Controllers. Read-Only Domain Controllers provide a one-way replication from your internal network to the DMZ and thus decrease the risk towards your network when a DMZ machine gets compromised. For details on how to deploy read-only DCs in the DMZ, see Active Directory Domain Services in the Perimeter Network. Open port 54782 in the firewall. Adaxes Web Interface and Adaxes Administration Console use port 54782 for communication with the Adaxes service. The port number can be changed if required. Note: The Softerra.Adaxes.Service.exe.Config file is located in the folder where the Adaxes Service is installed (by default, C:\Program Files\Softerra\Adaxes 3\Service). Note: When upgrading from Adaxes 2012.1 (build 3.3.8815.0) and earlier, you need to perform additional steps to preserve Approval Requests. Unzip the script to the folder where the Adaxes Service is installed (by default, C:\Program Files\Softerra\Adaxes 3\Service). Run the script using the following command: .\BackupApprovalRequests.ps1 -defaultServiceAdminName "<admin_username>"
where <admin_username> is the username of the default service administrator. If you are logged on as the default service administrator, you can omit this parameter. Uninstall the old version of Adaxes. If you are moving an Adaxes service that shares its configuration with other Adaxes services from one computer to another, you need to manually transfer the information on pending Approval Requests. Copy the file to a similar folder on the computer to which you are transferring Adaxes service. Install the new version. During the installation, join the new Adaxes service to your configuration set. Wait until the configuration is replicated. To make sure that the replication is complete, launch Adaxes Administration Console, connect to the newly installed Adaxes service and wait until the connection is established. Back up the configuration of your Adaxes service using the Softerra.Adaxes.BackupRestore.exe tool. This tool is located in the folder where the Adaxes service is installed, which is C:\Program Files\Softerra\Adaxes 3\Service by default. Unzip the script to the folder where your Adaxes service is installed (by default, C:\Program Files\Softerra\Adaxes 3\Service). <backup_file_path> - the path to the backup file created on the 1st step. <admin_username> - the username of the default service administrator. If you are logged on as the default service administrator, you can omit this parameter. The script will output a new backup file updated with the data required to restore Approval Requests. It will be placed in the same folder as the source backup file and will have the same file name with .fixed added to the end. Use this file to restore Adaxes service configuration. Back up the configuration of your Web Interface using the Softerra.Adaxes.Web.UI.Configuration.exe tool. This tool is located in the folder where the Adaxes Web Interface is installed, which is C:\Program Files\Softerra\Adaxes 3\Web Interface by default. Restore the configuration of the Adaxes service using the Softerra.Adaxes.BackupRestore.exe tool. Restore the configuration of the Adaxes Web Interface using the Softerra.Adaxes.Web.UI.Configuration.exe tool. Follow the instructions to download and install Microsoft .NET Framework Version 3.5 SP1. Follow the instructions to download and install Microsoft Active Directory Lightweight Directory Services. Log on as an administrator, click Start, point to Control Panel. Click Turn Windows features on or off to display the Windows Features dialog. Click to expand Internet Information Services, and select the World Wide Web Service check box. Follow the instructions to download and install Windows PowerShell 2.0. Note: Windows 7 and Windows Server 2008 R2 have PowerShell 2.0 installed by default.